So last week I was super depressed and I shut everything down and did some paintings. One of those paintings was a watercolor for my little sister and, soon after I finished and sent it to her, I got to talk to her. She's a super-busy and important RA this year and she's all, "I have duties!" which makes me giggle because I'm actually less mature than my 19-year-old sister. Anyway, I was really glad to talk to her and it made me feel better and we talked about Harry Potter and fantasized about getting sister tattoos. It was nice. Then, a few days later, we both got some surprise mail. She got my painting. I got a crazy sweet letter and a signed first issue of Pretty Deadly by Kelly Sue DeConnick. It was pretty awesome. 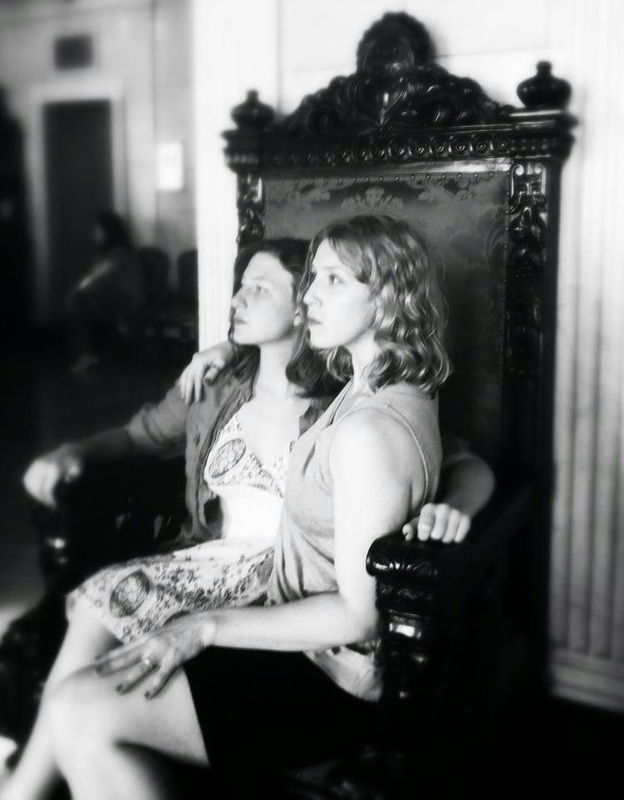 This whole experience reminded me of how wonderful it can be to have a sister. Even though we, for the most part, grew up several years and hundreds of miles apart, we've always been close. I get her. She gets me. Ok, these chicks are just basically walking chaos. 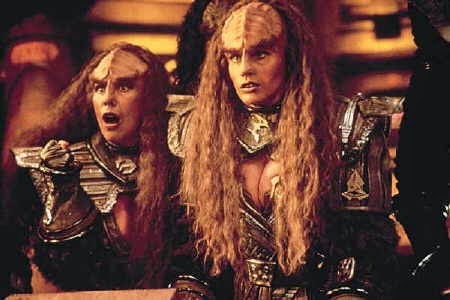 They show up in "Reunion" to #1- Ruin Mr. Worf's day and #2- start a damn Klingon Civil War. They succeed on both counts. They show up again in DS9 to ruin Kira's day and then again in Generations to ruin everyone's day. Honestly, it feels like these women were in about twenty episodes but it was actually only 4 plus a movie. I guess they're just really memorable. I remember seeing this one when I was a kid and being pretty freaked out. At the time, I was an only child (my oldest sibling wasn't born until I was eleven) and the idea of there being a secret sister that no one ever told you about because the memory of their death was too painful to discuss just blew my freaking mind. And, I mean, when your dead sister is channeled through freaky little Kirsten Dunst, that doesn't make any of it easier to digest. 3- DS9: Nope nothing here, folks! Alright, these chicks were mentioned a lot but rarely ever seen. They were like some kind of rare, two-headed space unicorn. When I was re-watching all these last year, I couldn't actually remember if you ever do see them or if they're just talked about a lot. But, ultimately, they do show up... in a Captain Proton Holodeck program. We don't really know much about these two besides Harry's opinions about which one he wants to date and why. 5- Seven and Naomi: Voyager. Oh hush, I know they're not really sisters and I know a lot of folks hate Naomi but I don't care. I love these two. First, I love Seven and wrote at least one post about why. But, secondly, Naomi provides the perfect foil for the austere Seven. It probably helps that, because the age difference between me and my sister, I specifically identify with this sort of relationship. I get the way Seven wants to do her own thing and not be bothered by some little person asking questions and following her around and I get that she also doesn't want to let Naomi down. I get wanting to be close to a little sister but also being a little afraid of that kind of bond. I get it. Well, this is heartbreaking. Basically, Rinax (where Neelix' family lived) was hit by a crazy weapon of mass destruction called the Metreon Cascade and Alixia (who Neelix was very close to) was killed. The memory of Alixia haunted him for years thereafter and he struggled with survivor's guilt in a very real, heartbreaking way. He never stopped writing letters to her. Ok, pretty much everything I said about Neelix and his sister applies here. Except that we see the events that kill Elizabeth and then watch Trip deal with her death in a very fresh, raw way. The rage and malice he feels in grief fuel a new xenophobia and desire to seek vengeance against the Xindi. His struggle to overcome these feelings is an interesting part of his arc. Anything from TOS, you're asking? Honestly the closest I could get to this in The Original Series was imagining Kirk asking, "Does she have a sister?" anytime one of his bros got a girlfriend. Thanks, Johnny! I'm so glad to see you here too. Always makes me happy. 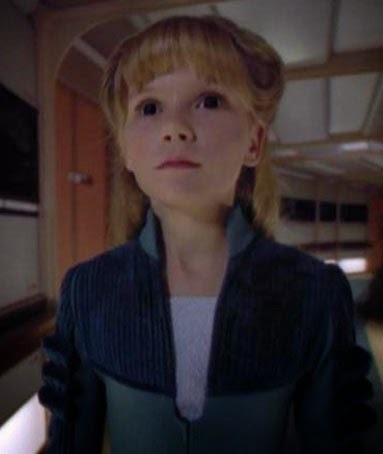 The only other sister I can think of is Ishara Yar, which doesn't do much to make this a happier bunch. Kelly, you know I actually had Tasha/Ishara on my mental list of sisters and completely forgot to include them when it came down to it. But, you're right, their story is similarly depressing.